As she talked with BusinessWest for this profile, Mary Fallon was thinking about what she might do on her first real outing with Lashanna, her first ‘little sister,’ whom she had just met through Big Brothers Big Sisters. The list of options — which includes hiking, playing soccer or basketball, shopping, or dog-walking, among others — reveals just some of the things Fallon enjoys when she’s not working as media director for Springfield-based Garvey Communication Associates. Especially the dog-walking part. Fallon counts her 95-pound weimaraner, Riley, as her best friend. “We do everything together,” she said, noting that the two walk her neighborhood in Springfield for at least an hour a day, more on weekends. Lashanna is apparently a dog lover, so the two should hit it off. In the community, Fallon has donated time, energy, and expertise to several organizations and causes. She helped lead efforts to collect personal care and clothing items for the homeless for St. Francis Chapel, a downtown Springfield shelter. She recorded a radio public-service announcement, used social-media channels to build awareness of what the chapel was doing, and coordinated media coverage to further spread the word. Fallon is also a volunteer and presenter for Media and Marketing for Middle School, a vocational mentoring program at the Zanetti School in Springfield. When asked where her career might take her, Fallon said she has yet to think that through. For now, she’s focused on what she and Lashanna might do next weekend, and what route the next walk with Riley might take. 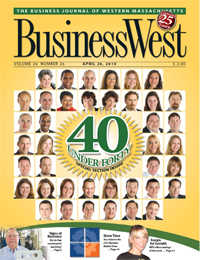 You could call this a good dog-gone class of 40 Under Forty winners. Canines are dominant in this year’s photographs, with several breeds, including the basset hound, weimaraner, and rottweiler, among others, represented (apparently cats don’t sit still for this kind of thing). There’s even a cartoon dog that has become a company’s logo. But members of this class are much more than animal lovers — although that’s a good start. They’re also successful in business and contributors within the community, helping those with two legs as well as four. And, like the three that came before it, the class of 2010 is diverse, with a number of business groups and nonprofit agencies represented. There are entrepreneurs as well, with members starting businesses in the high-tech sector, marketing and public relations, and even motion pictures. This year’s class has several lawyers, accountants, and bankers, as in previous years, but it also has managers of nonprofits ranging from Springfield School Volunteers to the United Way to Big Brothers Big Sisters. And the contributions within the community are diverse as well, from work (if you call running work) to raise funds for the Jimmy Fund to efforts on behalf of Habitat to Humanity, to initiatives to rescue basset hounds. Overall, this is an inspiring class, perhaps best exemplified by the story of Nancy Bazanchuk (page A4), this year’s highest scorer. Born with a congenital condition that required the amputation of both legs above her knee, she is now program director of Disability Resources for the Center for Human Development. In that role, she has grown the department exponentially over the past 13 years, and today empowers people with physical disabilities through participation in a number of different sports. There are a number of stories like Bazanchuk’s over the next 30 or so pages. They involve people who were inspired, and are now inspiring others. People like Natasha Clark, who was reminded daily by her father about the importance of reading and learning. He didn’t live to see her become a respected journalist and, now, program manager for Springfield School Volunteers, but he’s always been a force in her life. Or people like Jill Monson, who says she learned from the death of her mother that one never knows how much time they have, so they have to make the most of each day. She does, and she named the business she started after her mother — sort of. It’s called Inspired Marketing & Promotions because her mother inspired her to start it. Nancy Bazanchuk David Beturne Raymond Berry Jr. This year’s nominations were scored by a panel of five judges, who took on the daunting task of reviewing more than 100 nomination forms and choosing 40 winners from that impressive pool. Denise Dukette, associate director of the Western Mass. Enterprise Fund, who serves as director of lending and head of operations for that organization, a nonprofit community-loan fund that works with banks and other lenders to enable financing for businesses that would otherwise not qualify. Ronn Johnson, president of R.D. Johnson Consulting in Springfield, which specializes in strategic planning and organizational development. Formerly, he served as director of Community Responsibility for MassMutual. Kathy LeMay, owner and founder of Raising Change, a Florence-based company focused on building bridges between philanthropists and nonprofits. The highest scorer among the 40 Under Forty Class of 2009, she recently completed a book titled The Generosity Plan. Jeff McCormick, a partner with the Springfield-based law firm Robinson Donovan, and one of the region’s preeminent trial lawyers. He specializes in business litigation, personal-injury law, federal litigation, professional-malpractice law, and legal ethics. Marla Michel, executive director of Strategic Communications and Outreach at UMass Amherst. In this recently created role, she will help lead efforts to build awareness and understanding of research and scholarly accomplishments among internal and external constituents and to expand the university’s role in local and regional innovation. Previously, she served as director of Research Liaison and Development. Lindsay Porter says the new title on her business card reveals quite a bit more about what she does than her old one. ‘Leadership and development specialist’ has replaced ‘employment specialist,’ she said, in a move that is part of a restructuring at Big Y Foods, but also an attempt to better explain Porter’s role — both within the company and also with some of its programs in the community. Porter handles recruiting and hiring duties for Big Y, as well as other employment responsibilities, but she also coordinates leadership and development programs for store managers. Meanwhile, Porter is heavily involved with the Springfield Work Scholarship Connection program as one of the company’s management representatives. The initiative helps 40 selected students at Sci-Tech High School in Springfield stay in school and graduate by having youth advocates work with them at school, home, and work. Participants are then eligible for hire by Big Y upon graduation if certain criteria are met. “We work with the students to help build self-esteem and develop the skills and values needed to get and keep a job; it’s in everyone’s best interest that we do something to help students graduate,” she said, adding that it is Big Y’s desire to expand the program to other schools and communities. In addition to her duties with Springfield Work Scholarship Connection, Porter gives back to the community in a number of other ways. She’s on the board of the Human Resource Management Assoc. of Western New England, and also on the senior HR roundtable with the Economic Development Council of Western Mass., the youth council of the Regional Employment Board of Hampden County, the Business Advisory Council of Community Enterprises, and the Mass. Rehabilitation Commission Business Advisory Council, among others. She’s also on the membership and arts committees of the Young Professional Society of Western Mass. and the Women’s Leadership Network of Western Mass., which has, as its mission, the advancement of women of all ages and ability. Considering all this, Porter’s new title fits her perfectly. Age 37: President and CIO, Berkshire Money Management Inc. There are many in Berkshire County who are thankful for Allen Harris’ support; most have two legs, but others have four. It was a hard, direct message in a fearful economy, and by any account, sage advice for all those in attendance. But there is one group that benefits from Harris’ expertise on a daily basis who couldn’t even get in the door that day. Such is the commitment from this avowed animal lover that when BMM opened its new headquarters a few months ago, the site was chosen for its adjacent vacant lot. “We also bought that to put in a playpen of sorts for the dogs,” he said. A dog’s life, indeed. With close to $240 million under management, BMM is doing quite well. Harris explained that market advice isn’t a commodity — clearly there are winners and losers. Lorenzo Gaines is certainly proud of his 40 Under Forty plaque, but he has a far bigger prize in mind — an Academy Award. And not just any Oscar, mind you, but Best Picture. He knows that’s a very lofty ambition, but he’s not going to even consider the sentiment that his goal is unrealistic or out of reach. That’s because his day job boils down to help convincing young people that nothing — especially a college education — is beyond their grasp. “That pretty much says it all,” Gaines noted, adding that so does the name he gave to his boutique film-production company: No Sleep Productions. Gaines has long been involved with film, and as a student at Columbia, his ‘short,’ as they’re called, won the Hallmark Entertainment Producer Development Award, the most prestigious honor for that realm at the school. Currently, he’s working on a few scripts that he hopes to turn into successful productions. One is a documentary on fathers that’s been in progress for several years now, and the other is a feature film on the life and death of Len Bias, the University of Maryland basketball star who died a day after being drafted by the Boston Celtics in 1986 due to cocaine intoxication. “That’s when the war on drugs was declared and crack was considered an epidemic,” said Gaines, speaking of the historical significance of Bias’s death, but adding quickly that there was and is a personal element to the tragedy. “That was a watershed in my life; it was like the shot heard ’round the world. “I believe film can be used as a catalyst to change people’s lives,” Gaines continued, meaning his own, as well. Daniel Finn never forgot a language lesson from high school. “I remember learning that the words ecology and economy share the same root word, ‘eco,’ meaning ‘home’” — a fact that helped him see the connection between taking care of both the economy and the planet. Finn eventually found a way to meld those concepts, launching Pioneer Valley Local First in 2001. The group promotes buying local by emphasizing both the economic benefits of keeping dollars in the region and the lessened environmental impact of doing so. One major accomplishment was the creation of the Pioneer Valley Local Business Guide, a detailed, categorized listing of area businesses that have aligned themselves with the organization’s mission. Meanwhile, Finn has worked for 13 years as an employment specialist with Riverside Industries, helping people with disabilities develop life skills and procure jobs. He and a client with Down syndrome recently cleaned up a bike path from Amherst through Hadley, Northampton, and Florence, removing more than 1,000 pounds of trash from the path and the surrounding woods. Again, it’s that concept of home that helps him bridge a perception gap between the environment and economic growth. “When I explain this to my environmental friends,” Finn said, “they appreciate business more, and when I say it to business-minded people, it helps them to understand the importance of taking care of our air and water, and having a stable climate. Age 26: Media Director, Garvey Communication Associates Inc. The list of options — which includes hiking, playing soccer or basketball, shopping, or dog-walking, among others — reveals just some of the things Fallon enjoys when she’s not working as media director for Springfield-based Garvey Communication Associates. Especially the dog-walking part. Fallon counts her 95-pound weimaraner, Riley, as her best friend. “We do everything together,” she said, noting that the two walk her neighborhood in Springfield for at least an hour a day, more on weekends. Lashanna is apparently a dog lover, so the two should hit it off. Her current involvement with Big Brothers Big Sisters is the latest example of how Fallon mixes her job responsibilities — which include public relations, media buying, and social media — with civic involvement. In the community, Fallon has donated time, energy, and expertise to several organizations and causes. She helped lead efforts to collect personal care and clothing items for the homeless for St. Francis Chapel, a downtown Springfield shelter. She recorded a radio public-service announcement, used social-media channels to build awareness of what the chapel was doing, and coordinated media coverage to further spread the word. Fallon is also a volunteer and presenter for Media and Marketing for Middle School, a vocational mentoring program at the Zanetti School in Springfield. When asked where her career might take her, Fallon said she has yet to think that through. For now, she’s focused on what she and Lashanna might do next weekend, and what route the next walk with Riley might take. 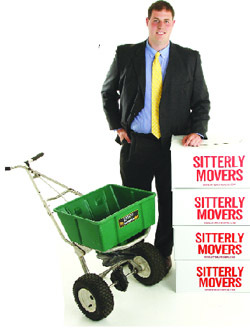 Commercial and Residential Sales, Roger Sitterly & Son Inc.
At 16 years old, Anthony Gleason was starting his own business while most of his friends were working for others. Not many people his age are so entrusted with and invested in the livelihoods of their co-workers, but Gleason takes it in stride as part of the job. And he approaches his charitable deeds with the same conviction. “Right now, I’m at an age where the only thing I can really do is donate to such organizations as the Jimmy Fund and the Susan B. Komen Cancer Foundation,” he said. Manager of the Tax Department, Meyers Brothers Kalicka, P.C. 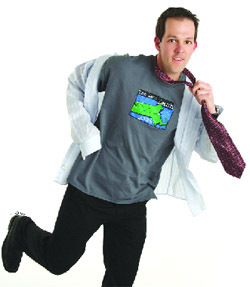 As he talked with BusinessWest for his 40 Under Forty profile, Sean Wandrei was in training for the Boston Marathon. Sort of. Late March is the busiest of times for any accountant, and Wandrei had many other things on his plate as well, from a class he’s taking at the University of Hartford to a host of duties with the Young Professional Society of Greater Springfield. So that aforementioned ‘training’ amounted to some long runs on weekends, which wasn’t going to be enough for him to be in top condition for one of his favorite events. But that was OK, because for Wandrei, ‘Boston,’ as runners call it, is a race he runs essentially for fun and to help raise money for Griffin’s Friends, a group named in honor of Griffin Kelleher, who succumbed to childhood cancer several years ago. Wandrei and about 60 others were there in their blue Griffin’s Friends singlets for this year’s race, staged on April 19. Wandrei has run in about a dozen marathons now, as well as a 50-mile race, and also a relay run between Mount Greylock and Boston to benefit the Jimmy Fund. He says the running, both the races and training, provides a relaxing counter to his fast-based work as manager of the Tax Department for Meyers Brothers Kalicka. Add all of this up (that’s an industry term), and one can see why Wandrei is on the fast track — not in Boston, but everywhere else. Nancy Bazanchuk says that when individuals with disabilities are competing in sports, they feel like athletes, not individuals who happened to be disabled. Born with a congenital condition that required amputation of both her legs above the knee, Bazanchuk didn’t let that stop her from becoming a varsity swimmer while attending Bridgewater State University. And she’s making it her life’s work to help others enjoy the experience of competing in the pool, on the ice, or in the gym. For the past 13 years, Bazanchuk, the highest scorer among this year’s field of 40 Under Forty candidates, has been program director of Disability Resources for the Center for Human Development. Now, as then, this is a department of one full-time employee, but since Bazunchuk — described as not simply the face of the program but its heart and soul — started, Disability Resources has seen exponential growth, from serving 69 individuals to more than 800. They range in age from 3 to 97. Those numbers speak to her commitment to empower people with physical disabilities through participation in sports ranging from wheelchair soccer to golf; from biking to bowling; from dance to track and field. The most recent addition to that list is sled hockey, with a team — the Western Mass Knights — that recently competed in a tournament in Westfield. Bazanchuk, who provides case management for 125 people with disabilities every year, played a key role in the creation of that squad, which filled a void after several area young people aged out of a Shriners sled-hockey unit and were looking for a team — and a way to keep competing. And she’s also the goalie. “How many people get to play sports as part of their job?” she queried when BusinessWest asked about the rewards she takes from her work. She then elaborated, noting that she takes great pride in helping people build self-esteem and feel like they’re part of the community. While also feeling like athletes.